Microsoft Scroogled store: Google responds, mocks rival's "wearables" venture. 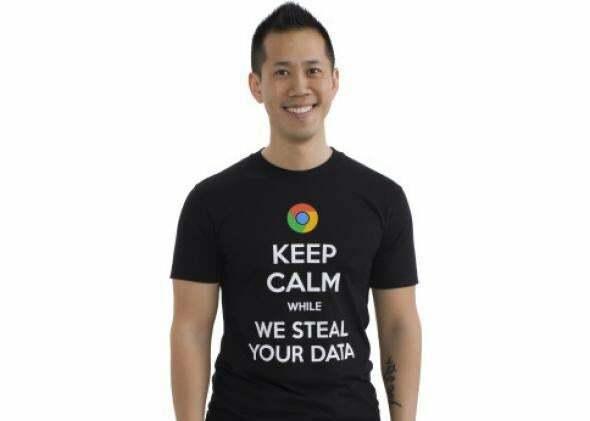 This week, Microsoft unveiled a full line of anti-Google paraphernalia, including T-shirts, ballcaps, and coffee mugs with insignia such as “Scroogled” and “Keep calm while we steal your data.” Pointed, yes. Subtle, not so much. What we’ve found is that this Scroogled campaign has struck a chord with consumers. They really are concerned with the way Google treats them and their privacy. Hundreds of thousansd of people have signed a petition, and millions have visited the website. The T-shirts and the mugs are just a way for people to express their concerns with Google in a different way, but sort of a fun way. Microsoft’s latest venture comes as no surprise; competition in the wearables space is really heating up. I compared Microsoft’s scramble for the moral high ground to a beaten sports team claiming a “moral victory.” To stick with the sports analogies, Google’s statement strikes me as the equivalent of responding to a rival’s taunt by smirking and pointing at the scoreboard. In the wearable-technology category, that scoreboard right now reads Google 1, Microsoft 0. Of course, the game isn’t over just yet. Popcorn, anyone?